Since we first published this guide last year, we’ve seen several new cribs hit the market. None have delivered the same combination of value and sturdiness that we found in our original pick, Oeuf Rhea crib; it remains our top choice. We put twenty-four cribs from fourteen different manufacturers through a series of tests in choosing the best crib. We looked at how easily they converted, how sturdy they were, and found out what each model was made of. Then we put each crib through a series of tests using dumbbells, scratching materials, and even a weighted test manikin. Quality woods and finishes are what set the good cribs apart from the bad. The models that we tested are composed of pine, beech, birch or poplar—solid wood. Some cribs also included MDF, which stands for medium-density fibreboard. In general, hard wood cribs will outlast their fibreboard counterparts. We talked with professionals from the CPSC, and GREENGUARD, as well as industry professionals and manufacturers to help us find the best crib. Who Should Buy A Crib? Parents who want a safe, high-quality place for their baby to sleep at night. When shopping for baby gear, knock out the important items like a crib and a crib mattress first. It’s been my experience that because cribs take up more space than car seats and strollers in warehouses, stores may not have these items on hand. Special orders take time, and inevitably the finish you want will be out of stock. A tip for pre-ordering from a brick-and-mortar store: Once you’ve decided on the crib you want, buy it and see if you can pick it up at a later date. Most stores will be more than happy to accommodate this request. Lastly, the crib is the only piece of baby gear that’s designed to be used without any parental supervision. It must be safe. Prior to the advent of the convertible crib, many parents bought a bassinet, a crib, a toddler bed, and a full-size bed. Not only was this expensive, but it was also wasteful. These days, many cribs have the ability to expand or contract to service many different sleeping needs. In 2011, the CPSC approved updated regulations for cribs that ensured that newly-produced cribs would be safer. The regulations outlined several changes to the old requirements for cribs. The old-standard drop-side cribs are now banned, as are immobilizers and repair kits for older models. Another change requires that wood slats and mattress supports be made of stronger materials to withstand additional weight and force. What separates a good crib from the bad is the wood. Many parents worry about the materials used in their child’s crib. (As they should!) This includes the stain, the wood, and the process in which it is manufactured. Dagmar Ebaugh, a spokesperson for GREENGUARD, a group that awards private certifications to companies and products that have a minimal impact on indoor air quality, warned of VOCs. When we look at nefarious chemicals or products we often hear about formaldehyde. Formaldehyde is a byproduct of the manufacturing process of many pressed wood products. Formaldehyde is a known carcinogen, according to both the EPA and the World Health Organization. We like that the Oeuf Rhea crib is made of solid birch and baltic birch plywood and that the company uses water-based stains that are free of any VOC health hazards. Due to the fact that they’re manufactured in Europe, their products meet their strict standards, in addition to ours here in the States. Every crib—from those that cost as little as $100 to those that are custom-made in the $4,000 price range must meet these new rules. Now that we’re a few years beyond these new requirements, manufacturers have begun producing new models that change the way we look at cribs. We now see models that feature clear acrylic sides, or slats like the Ubabub Pod or the Nurseryworks Vetro. If you can’t justify their higher price points, you can still get many of their features in more budget-friendly cribs. What you should be looking for is a crib that meets or exceeds all standards, while being able to convert into something beyond a basic crib. On the topic of convertibility: don’t feel that you have to buy the most feature-laden and complex system out there. You’ll want to evaluate your lifestyle, and space, when determining the right crib for you. Many parents will have a second child soon after their first. For those parents, the crib goes to the newborn, and a new toddler bed is purchased, so you won’t always end up using the higher degrees of convertibility. When we interviewed Eli Gurock of the Boston- and Connecticut-area baby store Magic Beans, he echoed that sentiment. If you’re assembling this crib on your own, be careful when placing non-wood objects like a mattress support into the crib. A metal mattress support can easily scratch your crib, and leave indentations on the frame. While researching online, it’s a good idea to look for a crib’s overall weight. A heavier crib tends to be sturdier than a lighter one (although design and materials are a factor in sturdiness, as well). The cribs we tested range in cost between $120, with the Ikea Sundvik, up to $4,500 with the Nurseryworks Vetro crib. A base model crib that meets everything we consider mandatory is going to start at around $200. While the Graco Lauren crib and Ikea Sundvik were less money and very popular, they don’t feel sturdy; both models felt flimsy in our hands-on testing. Past the $700 threshold, you add features that you may not need, like systems that expand and contract into different shapes. I’ve seen my fair share of cribs; what separates a good crib from the bad is the wood. Most inexpensive—and even some moderately priced cribs—opt to use what is essentially plywood, sawdust and glue, with pieces of solid wood to achieve their look. These models look good in the store, but they won’t hold up in the long run. A toddler is going to jump up and down, maybe even chew on the side of the crib, and you’ll probably bump into or scratch the crib once or twice. Look for models that use birch, beech, or poplar woods, as they’re much harder and more durable than their plywood counterparts. We spent 20 hours testing the cribs themselves. We made sure that each best crib candidate was made from high quality materials both inside and out. While the cribs were assembled, we used our dumbbells and dropped them onto the mattresses in each crib to make sure that they were sturdy. A lot of the softer wood cribs were easily damaged. The next few hours consisted of taking the cribs apart and adjusting their mattress positions. Doing this provided greater insight into how well each crib was made, the same kind of insight that you would get from looking underneath the hood of a car. I appreciated how the Oeuf Rhea crib used a wooden mattress support, and how easy it was to adjust the positions. I used coins, wooden rattles, and teething toys to test how well the cribs stood up to baby’s teeth. I pressed the objects into the wood and observed how easily they were indented. A lot of the softer wood cribs, especially those made with combinations of wood and MDF, were easily damaged. Lastly, we asked real people to put their babies or toddlers in and out of the cribs. As a 5’5” adult of average strength, I was able to lift our 15-pound manikin in and out of each model easily, but shorter crib buyers will want to consider models with lower sides or higher mattress positions. The sides of the tested models ran between 30 inches and 40 inches. After our tests, I’m confident that the Oeuf Rhea crib is the best crib out there. You’re getting a high-quality crib that can convert into a toddler bed for a mid-range price. The Rhea earned top marks for being composed of both solid birch and baltic birch plywood that is constructed in Europe. The mattress can be lowered into lower positions and a toddler conversion kit can be added on to ensure that your crib will grow with your child. Gone are the days of cribs made out of sawdust and glue. While you won’t get acrylic panels, or a chair conversion kit, the Oeuf Rhea crib keeps things simple and safe. The Oeuf Rhea crib retails for $670 and is available in two different finishes. A matching dresser can also be purchased to go alongside. (Although we did not test the dresser.) These can be purchased direct from Oeuf, at online retailers, or at independent stores. One thing we noticed is that “modern” style cribs tend to be on the more expensive side, and that you can easily enter $1,000 to $2,000 territory on the crib alone. The Oeuf Rhea crib plus the conversion kit, and a good mattress, will cost you about $1,000. Throw in a nice fitted sheet, a waterproof pad and a Breathable Bumper, and you’re ready to go. The only thing that the Oeuf Rhea crib lacks is the ability to convert into a full-size bed. As mentioned before, many parents have children close in age, and buy their first child a toddler style bed. Cribs that advertise several configurations or add-ons, tend to be more expensive, and you probably won’t end up using all of their features anyways. For those who are looking to splurge on this important purchase, the Stokke Sleepi crib ($800) is a high-quality crib that will grow with your child. You can also purchase this as a system with the bassinet included. The Stokke Sleepi crib is oval shaped, so it saves space in smaller rooms. It’s composed of solid European Beech wood, and even has wheels on it so that you can move it around in the middle of the night. When your child reaches 18 months, the front panel is removed to create a toddler bed. Later on, you can purchase another extension to create a junior bed. This crib is purchased with a mattress, for which you have two great choices, and you’ll need to purchase specific sheets for it. The idea of custom sheets for a baby may seem outrageous, but a quick cost comparison between Stokke’s oval crib sheets, and a Naturepedic standard crib mattress sheet reveals a minimal price difference. Coming in at $200, the Davinci Emily 4-in-1 crib is a good alternative for those who want a less costly crib without many compromises. The Davinci Emily 4-in-1 crib has multiple mattress positions, and an included toddler rail, but lacked the heft of more expensive cribs. It also has higher sides and a rail that protrudes out from the front of it, which can make it more difficult to get a child in and out of, especially if you’re on the petite side. It’s made out of the same sustainable New Zealand pine found in the BabyLetto Mercer 3-in-1 crib, the Pali Torino 4-in-1 crib and many others we tested. If you’re looking to convert your crib into a full-size bed, purchasing the $89 full-size conversion kit, and a new mattress will get you there in no time. ● Oeuf Sparrow ($830) — Higher price than the Rhea and also does not include a toddler rail ($222). ● Franklin and Ben Mason 4-in-1 crib ($700) — Large sides may fit awkwardly into smaller rooms. Higher sides may be difficult for shorter parents. ● Franklin and Ben Liberty 3-in-1 crib ($400) — An upgraded version of the Jenny Lind crib. Harder wood is a welcome upgrade, but it still lacks structural heft of larger cribs. ● Oeuf Elephant crib ($718) — Constructed of MDF, not wood. This received a great write-up in the New York Times. The fast and easy assembly may change the way we look at future cribs. That being said, $718 for MDF based furniture is a lot of money. ● Natart Bella ($1,100) — High price and limited American availability. ● Oeuf Classic ($970) — Expensive to begin with, and the toddler conversion is sold separately. ● BabyLetto Harlow ($600) — Limited availability in stores. ● Nurseryworks Abbey Crib ($650) — Only available in one finish, and the toddler conversion is priced at $230. ● BabyLetto Mercer 3-in-1 crib ($360) — It’s more expensive than other pine-based cribs. ● DaVinci Jenny Lind 3-in-1 crib ($200) — Seems inexpensive, but it does not include the toddler conversion kit. ● Graco Lauren 4-in-1 crib ($150) — Very flimsy and lightweight. ● Ikea Sundvik ($120) — We can’t recommend this due to a shaky regulatory history wherein several similar models have been recalled. ● Bloom Alma Mini crib ($340) — I’d only suggest this for apartment dwellers. Works as a moderately priced bassinet, but you’ll need another crib or a toddler bed shortly after age one. ● Nurseryworks Vetro 3-in-1 crib ($4,500) — Significantly more than any other crib on the list at $4,500. ● MDB Classic Foothill 4-in-1 Crib ($400) — Good value, with an included toddler rail, but the wood on this model is soft. There are similar options from this manufacturer that are less expensive, or better made. ● BabyLetto Scoot 3-in-1 Crib ($360) —Another good option for those wanting a modern, but less expensive crib. Our complaint, as shared by reviewers, is that the toddler rail is hard to set-up, and it makes the crib feel much less sturdy when it’s in use. Use a lightly dampened cloth to wipe clean any dust, dirt or messes. Avoid using any harsh cleaning agents, as they may cause irreparable damage to your crib’s finish. Invest in a waterproof pad for your mattress. They are machine washable, and will take the brunt of the mess. We found a company named Babyganics that makes a plant-based all-purpose cleaner designed for cribs and changing tables, although we have not battle-tested it beyond a cursory use, although it seemed to work well for cleaning up older stains and water marks. Most manufacturers now utilize live chats through their website, on top of existing phone and email contacts. This is the fastest way to get in touch with a real person. If that’s unavailable, try utilizing phone or email for service. We emailed customer service from both Million Dollar Baby and Oeuf, we heard back within an hour. All service and repairs should be taken care of through the manufacturer. Year to year, crib models don’t change all that much. New models are typically announced in the fall, and are released in the spring or summer months. Here are a few products that will be launching in the near future. The Oeuf Fawn Bassinet and Crib System is due to be released this summer, and will feature a design that’s similar to our Step-Up pick, the Stokke Sleepi. A key advantage is that in crib mode, it uses a standard size mattress, which are less expensive and easier to find sheets for. This will retail for $1,100, sans a crib mattress. Stokke will be introducing a new set of products in their Home Collection. This features their new Home Crib, priced at $700, that can be fitted with a tent, or a roof, allowing for greater customization. 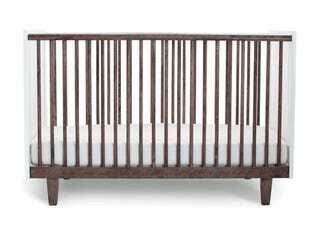 For parents wanting to make a bold statement with their crib, the Nursery Works Gradient Crib will be available soon, with a starting price of $7,500. What makes this crib so expensive? For starters, it’s composed of solid Maple hardwood and made in the USA. It’s also just really nifty looking. While we don’t expect this to fly off the shelves, it sure does look cool, and it pushes the envelope in terms of design—and price point. The Oeuf Rhea crib is made of European birch wood, and has a great two-tone appearance. It can easily convert into a toddler bed and fits a standard crib mattress. You can find it in stores, online, or direct from Oeuf, and it retails everywhere for $670. It’s sturdy, attractive, and built to last.